Copernicus was born on February 19, 1473, in Toran, Prussia (now Poland). His father, a wholesaler of copper, died when Nicholas was only 10. Copernicus’s uncle, Lucas’ Watzelrode, the Bishop of Ermeland, guided his education, which prepared Copernicus for a role in the Catholic church. His education at University of Cracow (1491­94) included humanities, law, canon law, medicine, theology, and astronomy. In January of 1497, Copernicus was appointed to a canonry at the Cathedral of Frauenburg, but he immediately took a leave to continue his studies. He remained abroad, finishing his studies, until 1506. Then Copernicus returned to live with his uncle, assisting in administration of the diocese while continuing his studies and writing on astronomy. Copernicus studied at a time when most people believed the ideas of the great astronomer, Ptolemy of Alexandria (c. 100­170). The planetary system that Ptolemy proposed put Earth at the center of the universe with the other planets, Sun, and moon moving around it. This system, which would eventually be replaced by Copernican theory, is known as geocentric (Earth­centered). Copernicus rejected such an idea. In 1510 he began work on a manuscript that proposed a heliocentric (Sun­centered) astronomy and outlined seven revolutionary hypotheses about planetary motion. Copernicus was reluctant to publish his manuscript when it was completed around 1530. This reluctance may have stemmed from a belief that many would attack such a revolutionary idea. However, he shared his ideas with some colleagues and church experts. Many of them encouraged Copernicus to publish his theories; one church official, Cardinal Schoenberg, even offered to cover the costs of printing. However, it was not until 1542 that Copernicus agreed to release his manuscript. Revolutions of the Heavenly Spheres was published in 1543. 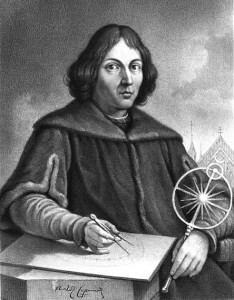 It is recorded that Copernicus glanced over his completed book just a few hours before he died on May 24, 1543, in Frauenburg. Copernicus’s heliocentric model of the Earth, Sun, and planets caused a cataclysmic change in our understanding of our place in the universe. For at least 14 centuries, people had believed that the universe revolved around Earth and humankind. Heliocentrism displaced humans from that central role. His new model formed the basis for future astronomical investigations for centuries to come. Copernicus’s ideas made sense in that they addressed many discrepancies in the Ptolemaic system; however, proof of the motions of the planets or Earth’s rotation was not immediately attainable in this era before telescopes. Therefore, by its very nature, the Copernican theory was open to controversy. Many religious leaders opposed his theories; indeed, the book remained on the Catholic church’s Index of Prohibited Works for 150 years. However, Copernicus started a revolution that would not be ignored. Many followers, including JOHANNES KEPLER (1571­1630) and GALILEO GALILEI (1564­1642), further developed his theories and used them as springboards for revolutionary scientific insights. Kepler expanded Copernican theory by formulating the three laws of planetary motion. Galileo supported heliocentrism after observing phases of Venus through a telescope and openly opposed the Roman Catholic church’s restrictions on Copernican theories. By stepping outside conventional ways of viewing the world, Copernicus was able to break free of many misconceptions of his time. His insights eventually stimulated a wave of new understandings of the universe and of the nature of science itself. Posted on March 5, 2015 by Natalie. This entry was posted in Astronomers. Bookmark the permalink.